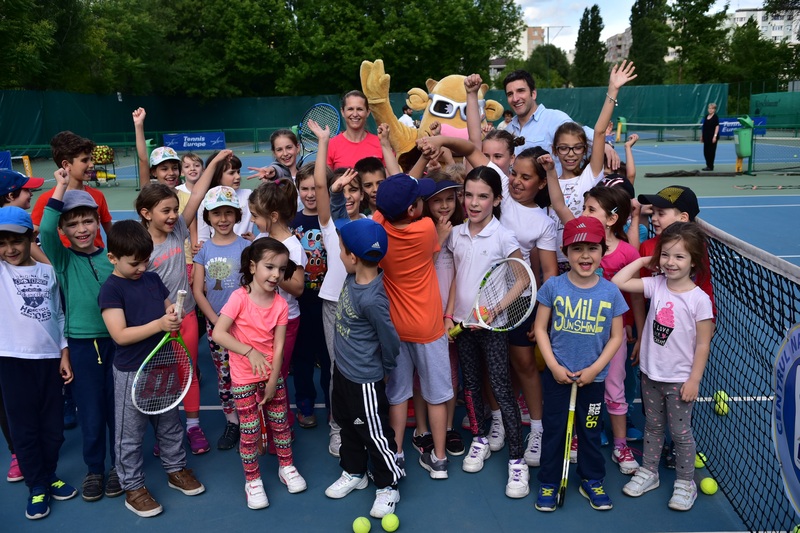 Actor Silviu Biriş played in an exhibition match against Alina Tecşor, the captain of Fed Cup Romania, at Kid’s Day from the Dr. Oetker Junior Trophy tournament. The kids present at Kid’s Day were rewarded with the delicious Paula Pudding desserts and with many other surprise gifts from the Paula Pudding Cow mascot. “When I was little I had the opportunity to play this exceptional sport. I think very highly of the Dr. Oetker Junior Trophy tournament. I am very happy whenever something is created that stands the test of time. I’m now imagining what it would be like if Alina Tecşor came to act a scene with me on the National Theatre stage. I reccommend tennis to children. Just like a musical instrument or a foreign language, a sport – why not tennis – should be a part in any Romanian’s life. Let’s create healthy, fulfilled generations!”, said Silviu Biriş. „It is a great joy to see these kids in our court at the National Tennis Center and and a great pleasure to be able to organize Dr. Oetker Junior Trophy at the Tennis Federation. I’ve seen here many girls that play very well, I was surprised to see how many there are. I wish that this tournament becomes more and more well known in the rest of the world. All our players deserve to be appreciated according to their own value. I’ve had fun playing with Silviu Biriş. Tennis is a beautiful, noble sport and kids can develop a healthy lifestyle with its help”, declared Alina Tecşor, the captain of Fed Cup Romania. In the 5th edition of Dr. Oetker Junior Trophy tournament, which is disputed by the end of this week, there are 125 players from 26 countries. The competition is supervised by the Tennis Europe Junior Committee, the regional association of the International Tennis Federation. During the tournament days, news and updated information can be found on www.frt.ro and on the tournament’s website: www.juniortrophy.ro, but also on social media, on the Facebook page Tennis Junior Stars. The organizer of Dr. Oetker Junior Trophy is the Romanian Tennis Federation. The official partner of the event is Dr. Oetker Romania. SCG – Smart Corporation Group is the promoter of this event.